Throwing up after drinking alcohol is a relatively prevalent issue for people who frequently indulge in heavy drinking. In addition to the vomiting, many other symptoms may also become present, ranging from diarrhea to headaches, and even sometimes cognitive impairment. Understanding the underlying factors which are causing these symptoms like throwing up from drinking is important to truly grasp the dangers that lie with heavy alcohol usage. 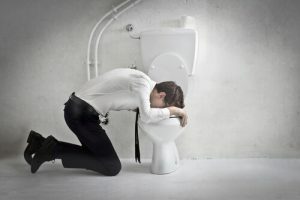 How does hangover cause vomiting? What are the dangers of vomiting after drinking alcohol? Does throwing up help a hangover? How to stop vomiting after drinking alcohol? What are the signs that emergency help is needed? Up to 12.5% of the population may have signs indicating some level of alcohol dependence. Heavy drinking can lead to adverse effects in the body, including more serious hangovers and severe vomiting. Vomiting after drinking alcohol the next day, along with the other symptoms that are often associated with a hangover, are caused by the physiological effects alcohol has on the human body. When drinks are consumed, the liver processes the liquid with the help of alcohol dehydrogenase, an enzyme found in the cells of the liver. The ADH enzyme converts the alcohol to acetaldehyde, a substance which is considered toxic. The body then needs to excrete the acetaldehyde – in cases where large amounts of drinks were consumed, and the body cannot excrete this toxic substance fast enough – which can lead to a vomiting hangover. This leads to many of the symptoms, such as hangover puking. Some effects of a hangover may also be caused by other interactions that alcohol has in the body. For example, the stomach’s lining is irritated with liquor – especially among heavy or frequent drinkers. The acidity content in the stomach is also increased. Furthermore, the liquor has some effects on organs like the gallbladder and the pancreas. All of these factors lead to hangover nausea and vomiting. When a person throws up the next day, they might be further contributing to dehydration – this is when it may sometimes be useful to look up a cure for vomiting after drinking. The person can also experience dry heaving after drinking any fluid. Dehydration is exceptionally bad for the body – it is crucial to consider the fact that the body exists out of water primary. Thus, when water content becomes too low, many adverse effects and complications can start to develop such as headaches or even hangover diarrhea. The effects that follow up this symptom may make the situation even worse. Hangover fever and some other potential symptoms may accommodate the throwing up at the same time. It should be noted that alcohol also leads to excessive production of bile acids – this production occurs in the stomach. This does not only further increase the risk of vomiting after having too many drinks, but the excessive acid content in the stomach may increase the likeliness of damaging the tissue in the esophagus when a person vomits. This happens because the extra stomach acids that were produced will be pushed up the esophagus during vomiting. Some people tend to become confused with the answers provided when it comes to determining if it is useful to throw up to avoid hangover effects. This is because it depends on when a person would throw up, as well as whether or not they throw up naturally. The main reason a person can puke after drinking is that the body tries to get rid of excess alcohol as a method of reducing the dangers of excessive alcohol usage. The same works for sweating when hungover – the body tries to remove the toxins in this way. In case of vomiting, this only accounts for a situation where the person vomits shortly following a drink – the absorption of the alcohol needs to be interrupted at this point. Once the alcohol has already been absorbed into a person’s bloodstream, then throwing up would not help to eliminate some of the alcohol consumed from a person’s system. Instead, this may rather be bad for the person, especially if the vomiting is self-induced. Thus, sometimes it may be better to consider the signs of a hangover as a way that the body is flushing out the alcohol and inducing vomiting may not be the answer to speeding up the process. How to get rid of a hangover headache is not the only popular question that people ask after a heavy night out. Many people also want to know how to stop throwing up from alcohol. Fortunately, there is a couple of strategies that a person can try if they seem to be throwing up the morning after drinking, or sometimes even just a few hours after the party ends. Over-the-counter drugs are available that may sometimes help to calm the stomach down and reduce vomiting. For some people, this may be the answer to how to stop vomiting after drinking. Some people also find it useful to eat some toast and to drink some tea or coffee. The particular vomiting after drinking alcohol remedies that work depend from one person to the next. Some suggest waiting it out might be a more appropriate answer to a question like how to stop throwing up when hungover. Not everyone will vomit – some may rather be concerned about other potential effects, such as how to get rid of hangover shakes. In some cases, the effects of a hangover may be too much for the human body and possibly lead to harmful complications. It is essential for any person who frequently drinks too much to know how to spot signs that they might require emergency or professional medical assistance. These signs may indicate more severe dehydration. Vomiting bile after drinking alcohol may also be a sign of gastritis, which occurs due to the irritation that alcohol imposes on the lining of the stomach and intestines. Blood in vomit after drinking is another sign something may be wrong. This could be a sign indicating the esophagus was damaged. A hangover is the result of overindulging in alcohol and can lead to multiple symptoms, including hangover vomiting. Some people may experience more severe side effects from heavy drinking the night before, and these hangover symptoms can be life-threatening. It is important to understand what is normal and what is considered possibly dangerous when it comes to hangover symptoms. The constant use of alcohol may lead to dependence. Do not hesitate to ask for the alcohol abuse treatment in case one have noticed the signs of growing problem. Rehabilitation in alcoholism centers is not somehting to be ashamed of.